directly on the exciting Hollywood Beach Boardwalk. private condo sundeck, patio or your condo livingroom. offer thats only 10 to 20 minutes away. You are directly on the Beachfront. Steps from the Condo Unit. 1 Parking Spot per Condo Unit. No Guest Parking. Additional Parking on the Street or Public parking garage. Condo Complex has a General Internet access to all. My Unit as well as its own Internet separate from the Condo Complex. LED 40" in Bedroom LED 55" in Living room with DVD. Atrium has Chairs, Lounge Chairs & Table with umbrella. The 1 bedroom/1 bathroom unit is fully furnished and equipped. The Bedroom has a queen size bed, dresser for him & her and night table, as well as (cable) Flat Screen TV. The Bathroom is completely renovated with interior glass block shower. All towels, starter toiletry and soap essentials are included. The Kitchen is completely renovated with full size stove/oven, refridgerator/ice maker, microwave and fully equipped (coffee maker, blender, toaster, etc). The Livingroom has a queen sleeper sofa, bar, glass dinning table for 4, dresser wall unit with large (cable) Flat Screen TV & DVD Player and definitely a large view to the ocean. 2 Air Conditioner/Heat Units; one in bedroom and the other in livingroom, ceiling fans throughout. Condo Grounds Amenities consist of 2 barbecue gas grills in private patio setting with tables, umbrellas and lounge chairs over looking the beach and boardwalk. Assigned private parking spot, heated swimming pool, shuffleboard, washer/dryer laundry room and private sundeck atop of condo. He beach out your front door, doesn’t get better than that! Great hosts, clean condo, fantastic location. If you don’t want to be in the heart of the mobs, this is the place. You are a two minute walk from the center of things. Allows for a quieter, roomier beach, but can still be in all the restaurants, shops, etc. by walking a couple blocks south. If you walk north a couple blocks there is a park on the beach and access to the bus and trolley system, providing you access to downtown Hollywood. The location is a 20 min cab ride from FLL. You can also use the water taxi that goes up the inter coastal to visit Fort Lauderdale, including Las Olas. The pool is clean and the front atrium area is great to enjoy, a beverage and watch the waves or sunrise. There are communal grills to enjoy some fresh seafood. Can’t say enough about this place. I’ve been coming for many years and it has become my second home. Everything about this rental is great! What a wonderful condo! Clean, cozy and perfectly located directly on the boardwalk in Hollywood Beach. Nothing blocks your view of the ocean! The condo building is perfectly maintained. Everything about the grounds is meticulously cared for. This condo itself is totally renovated and had everything we needed to enjoy our stay! The condo is right beside the laundry room, which is super convenient. It is also just steps to the parking lot, pool and front patio. No stairs to climb with heavy luggage! It was especially nice to meet Alan and Amy at the condo when we checked in, such wonderful, warm people! They truly care about your stay and pride in ownership is so evident! This is not a condo that is just being rented just to make a buck, they truly love their home and it shows! The location on the boardwalk is perfect because it's at the quiet end, just far enough away from the hustle and bustle of Margaritaville. We spent many hours sitting out front watching the ocean and the people walk by. Thanks Alan and Amy! We hope to be back soon!!!! This was our second stay in the same building. The area is fabulous! The property is clean and well maintained. The boardwalk is wonderful, well lit at night. Use your smartphone to find local restaurants -- there are many! Flamingo Gardens is a MUST SEE -- allow at least 5 hours! Alan -- the property owner -- is very friendly and helpful. We will be back there! I am very glad and appreciated that you liked my Condo Unit directly on the BroadWalk and its cleaness / accomodation to many great things in Hollywood Beach. You all where great and welcoming. Hope to see you again in the future. My husband & I have been coming to Hollywood Beach for several years now & this has been the BEST place & BEST experience we have ever had! The condo was BEAUTIFUL, CLEAN, FULLY EQUIPPED WITH EVERYTHING, nice modern decor with beautiful ocean theme, all kitchen appliances stainless steel over stocked with all your needs. Alan the owner was the most nicest, attentive, reliable hands on host. He went over & beyond to accommodate us & made sure our stay was an enjoyable one. I was amazed to find the closet filled with nice almost new beach chairs, large beach towels, a beach towel blanket, tote bags, nice cooler, roller bags, top of the line beach umbrella & the list goes on. Ocean Grande is directly on the beach Broadwalk. This condo has a full side ocean view! You can sit on the nice comfortable leather sofa or dinette table & see the ocean. The window has a large view & also over looks a nice ( I will call ) courtyard not off street parking. The pool & surrounding grounds was clean well kept & so tropical. The other owners & annual guest on the premises were nice, friendly & welcoming. The location is beautiful close enough to everything but not in the center of all the busyness. There’s a park a block up with a look out tower. Also you can rent bikes at the park. We didn’t rent a car we walked everywhere since everything was within a mile( I mean everything). This has been our BEST vacation & we traveled other places & the Caribbean & never felt so at home. Best welcoming ever! Alan was here to greet us. Give us all the info pertaining the area & Ocean Grande. He made us feel like family. He introduce us to others who reside there or have their weekend condo unit getaway that were outside overlooking the beach. I can go on & on but you have to come to experience what my husband & I have experienced here at Ocean Grande & a WONDERFUL host like Alan. Hopefully we’ll be able to lock in a deal with Alan & make this our yearly getaway. Thank you Alan for making this a memorable, relax, home away from home BEST two weeks vacation. WE LOVE IT HERE & YOUR BEAUTIFUL CONDO! What more can I say about Betty & Eric. Beautiful people, humble and understanding. They returned the Condo Unit spotless, way beyond what was expected. 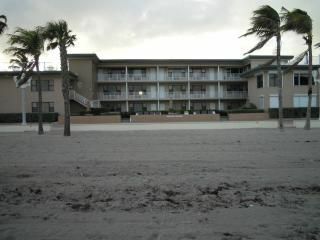 This is what I strive for to have a tenant with complete trouble free, enjoyable stay at Ocean Grande Beach Club. Vacation Time. Love you guys. Come back Soon. Exactly as pictured, right on the beach! The condo was a perfect place for our weekend getaway on the beach. Alan was a great host. Everything we needed was right there. The beach umbrella was broken but we didn’t end up needing it. We would stay here again. I am pleased that you were very content with the Condo Unit in itself that provided all the comfort, cleanliness, ocean view and directly on the Broad Walk accommodations. The Beach Chairs and Umbrella are not expected to be provided by the Owner, as the Condo Complex in itself has Lounge Chairs and Umbrellas. Never the less, as it was made aware to my attention, the Umbrella in my unit, accessible to my tenants has been replaced with a new one for future tenants to use as well as the Condo Complex ones. No fui yo quien se quedo en el departamento sino que lo alquile para mis suegros. Volvieron muy contentos tanto con el departamento como con el lugar. SU proximidad a la playa y al board walk les permitio disfrutar, a pesar de no tener auto, no solo del mar sino de caminatas y los cafes y restoranes cercanos. Many outdoor activities for all age groups nearly at your door step. This is Location, Location, Location. Owner E-Mail (alanpereza@live.com) Cell (305-742-7795) All Rates are Negotiable. Monthly Rates are very attractive. Give me a call and start packing to enjoy our Fabulous Hollwood/Florida year round sunny weather and especially warm Winters.